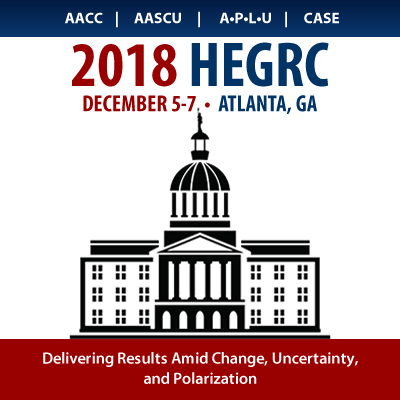 Now in its 25th year, the Higher Education Government Relations Conference is an educational forum for professionals whose responsibility it is to foster effective governmental and community relations on behalf of public colleges and universities and state systems of higher education. The conference reflects a unique partnership among four national higher education associations: the American Association of Community Colleges, American Association of State Colleges and Universities, Association of Public and Land-Grant Universities and the Council for Advancement and Support of Education. The conference is coordinated by government relations staff from these associations and the Task Force on Higher Education Government Relations, comprised of state governmental affairs professionals representing the entire spectrum of American public postsecondary education. To register: After logging in, choose either "Register Myself" or "Register Someone Else" (choose the later to register someone on your campus only). Register individuals one at a time. Then, make sure to expand each day to see and choose the conference options for that day. Finally, enter your special considerations and hit Save. For questions, please email support@aascu.org.